First used in the late nineteenth century to describe the new rhododendron shade of garnet discovered in North Carolina, Rhodolite is the name used to describe the lovely pinkish, purplish or purple-red garnet which is a mixture of Almandite and Pyrope. This popular garnet shows a wonderful velvety red with a fine purple or raspberry colored undertone. Unlike the common red garnets which tend towards a very deep red with a brownish secondary hue, rhodolite is lighter and brighter in color. 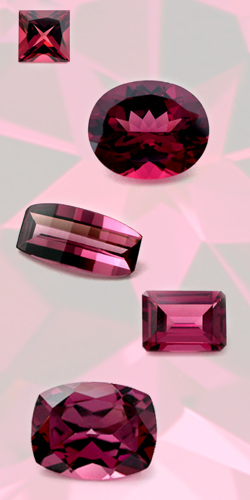 The best specimens are a rich raspberry that can sometimes resemble the more expensive rubellite tourmaline. Though originally found in the USA, it now comes mainly from the gemstone mines in East Africa, India and Sri Lanka. Common shades of Rhodolite include red, purplish red and the popular raspberry rhodolite, a rich red-purple with bright lavender highlights.